Easter Sunday is the high point of the Christian year, as we celebrate the resurrection of Jesus. The physical resurrection from the dead of Jesus Christ is the cornerstone of Christianity. Jesus’ resurrection confirms everything he said about who he is. He is not some long dead historical figure. He really is a man whose identity is God. He is risen. He is alive today and you can experience his presence with you. Confirmation is a sacred day of commitment and celebration in the life of an individual and the Church. Photo courtesy of Brecksville (Ohio) United Methodist Church. 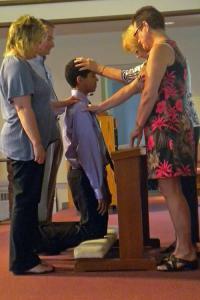 Many lifelong United Methodists have fond memories of their confirmation class. Sometime during adolescence, they met with a group of their peers, some adult leaders, and their pastor. They may have gathered weekly in the church basement, during a youth Sunday school class, or maybe for a weekend retreat at a campground. When the classes were complete, they then stood before their congregation, where the pastor and others put their hands on them while a blessing was said. Some then received a special lunch or a gift from their church. Because confirmation is so closely linked to baptism, the order for the service is contained within Baptismal Covenant I in the front of The United Methodist Hymnal. After the confirmands answer for themselves the same questions their parents and/or sponsors did when they were baptized, the pastor will say to the confirmand, “Remember your baptism and be thankful.” This can cause some confusion for those baptized as infants too young to have memory of the occasion. 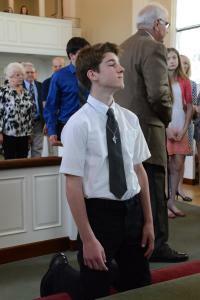 Finally, confirmands are asked to take the same vows of membership in The United Methodist Church and their local congregation that all who join are asked. Because our journey in the Christian faith is not intended to be a solo venture, throughout the service there are places for the congregation to participate. In different parts of the service, they renew their baptism vows, profess their faith together with the confirmands, promise to do all in their power to support these newest professing members, and with them renew their covenant to be the body of Christ for the world. Parents and church leaders often ask what age is most appropriate for young people to participate in confirmation. The issue is not so much about a chronological age, but rather about one’s readiness to assume the vows of professing membership. “When you think about what’s required to live out these vows with integrity,” Burton-Edwards says, “it requires a measure of adult agency.” At what age that happens varies among individuals and cultures. “If you look at the earliest point at which we give adult responsibilities,” Burton-Edwards explains of the culture in the U.S., “it’s the driver’s license.” This might indicate that a good time for people in the U.S. to consider confirmation is about the age of 16. For others it might be sooner. Pastors may invite family members and others to participate in confirmation, a symbol of their continued support of the youth’s faith journey. Photo by Linda Hall, Orchard United Methodist Church, Farmington Hills, Michigan. The ability to live into the vows is the key determining factor, not a particular birthday. Confirmation is not a destination. It is more of a way station, a place where we renew our commitment to the journey we have been traveling under the care of others. It is also a time for a congregation to celebrate their young people’s commitment to “live as a faithful disciple of Jesus Christ,” and to renew their commitment to do the same. This article was originally published October 23, 2015. Lord, thank you that you have given me a hotline to you. Help me, like Jesus, to seek solitude with you, to withdraw to lonely places, pray and hear your words.